If you want to keep your page out of the search results, there are a number of things you can do. Most of ’em are not hard and you can implement these without a ton of technical knowledge. If you can check a box, your content management system will probably have an option for that. Or allows nifty plugins like our own Yoast SEO to help you prevent the page from showing up in search results. In this post, I won’t give you difficult options to go about this. I will simply tell you what steps to take and things to consider. Why do you want to keep your page out of the search results? It sounds like a simple question, but it’s not, really. Why do you want to keep your page out of the search results in the first place? If you don’t want that page indexed, perhaps you shouldn’t publish it? There are obvious reasons to keep for instance your internal search result pages out of Google’s search result pages or a “Thank you”-page after an order or newsletter subscription that is of no use for other visitors. But when it comes to your actual, informative pages, there really should be a good reason to block these. Feel free to drop yours in the comments below this post. If you don’t have a good reason, simply don’t write that page. If your website contains a section that is targeted at, for instance, an internal audience or a, so-called, extranet, you should consider offering that information password-protected. A section of your site that can only be reached after filling out login details won’t be indexed. Search engines simply have no way to log in and visit these pages. If you are using WordPress, and are planning a section like this on your site, please read Chris Lema’s article about the membership plugins he compared. Like that aforementioned “Thank you”-page, there might be more pages like that which you want to block. And you might even have pages left after looking critically if some pages should be on your site anyway. The right way to keep a page out of the search results is to add a robots meta tag. 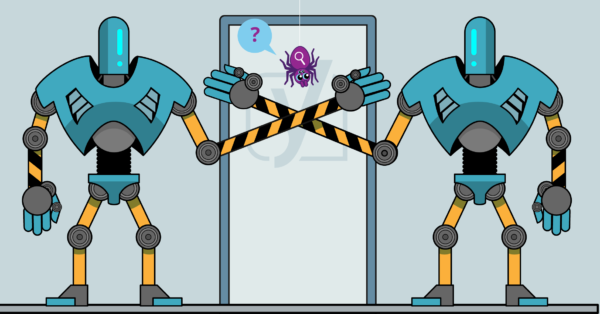 We have written a lengthy article about that robots meta tag before, be sure to read that. Adding it to your page is simple: you need to add that tag to the <head> section of your page, in the source code. You’ll find examples from the major search engines linked in the robots meta article as well. Are you using WordPress, TYPO3 or Magento? Things are even easier. Please read on. The above mentioned content management systems have the option to install our Yoast SEO plugin/extension. In that plugin or extension, you have the option to noindex a page right from your editor. 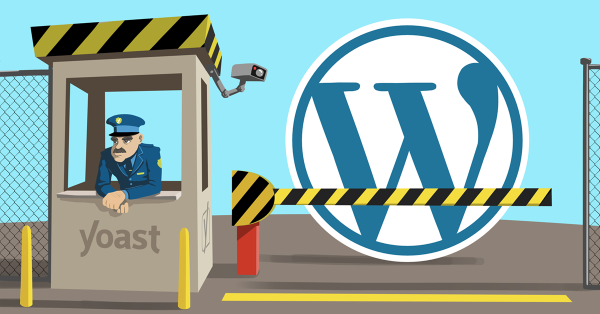 In this example, I’ll use screenshots from the meta box in Yoast SEO for WordPress. You’ll find it in the post or page editor, below the copy you’ve written. In Magento and TYPO3 you can find it in similar locations. 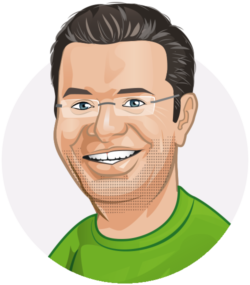 Click the Advanced tab in our Yoast SEO meta box. It’s the cog symbol on the left. Use the selector at “Allow search engines to show this post/page in search results”, simply set that to “No” and you are done. The second option in the screenshot is about following the links on that page. That allows you to keep your page out of the search results, but follow links on that page as these (internal) links matter for the other pages (again, read the robots meta article for more information). The third option: leave that as is, this is what you have set for the site-wide robots meta settings. It’s really that simple: select the right value and your page will tell search engines to either keep the page in or out of the search results. The last thing I want to mention here is: use with care. 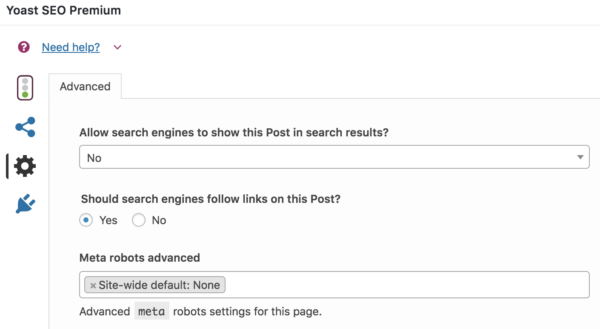 This robots meta setting will truly prevent a page from being indexed, unlike a robots.txt suggestion to leave a page out of the search result pages. Google might ignore the latter, triggered by a lot of inbound links to the page. If you want to read up on how to keep your site from being indexed, please read Preventing your site from being indexed, the right way. Good luck optimizing! Good points, vingold. I have also seen that it can take a long, long time to get content out of the SEs once it’s already been indexed. So if you plan on hiding some of your content, it’s best to do it right away rather than waiting. What is your opinion – Blocking URL´s with flag these pages inside Search Console these days. Let´s say that you have 30 pages indexed (pretty new website), and 15 are set to no-index (thank you pages, carts, etc). Search console will frag these pages as ´no-index´ of course, but could these pages be an negative impact on the ´indexation´ of the rest of the website? Or does these no-index pages influence the rest of the website? 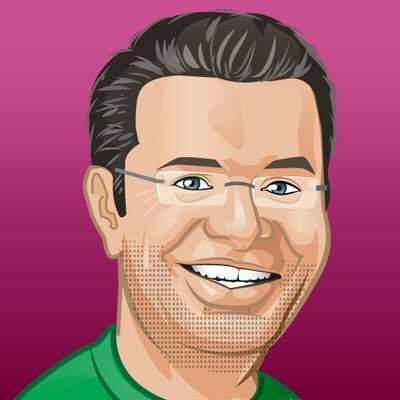 Does Yoast Premium has a function to remove indexed pages or posts that have already been removed? It doesn’t need to be a premium feature. Simply setting an indexed page to no-index will cause search engine bots to de-index it the next time the page is crawled. The reverse is also the case where a no-indexed page (intentional or not) can be caused to be indexed by setting it to ‘index’. Is there an easy way to exclude pages from INTERNAL search? Pages that we have excluded from search engines are still being shown when you use our internal search. You want more control over what you de-index, and you have the necessary technical resources. I have the opposite problem! Only joking! This is great and full of useful tips. This is so awesome specially this picture with spider….